10 key times to focus on in a seasonal calving dairy herd. As a vet I am constantly involved in herd investigations in dairy cows. My approach has now changed to one of planning around key times to ensure we maximise productivity. Like any other business dairy herds can benefit from having a plan around herd health. With most businesses they use key points that are crucial to running a business. With that in mind I have listed my top 10 Critical Control Points CCPs on grass based spring calving dairy farm. We must shift the focus from treating sick animals to reviewing performance in healthy animals in my opinion. This can be a key time in the yearly cycle of a cow. She is just finished her lactation and is preparing for the next. At drying off we can address any issues with intramammary infections or cell count. This should be done on an individual cow basis, deciding the need for dry cow therapy and giving each cow a teat seal to prevent or dramatically reduce dry period infections. It is also a critical time to assess body condition score and decide the nutritional requirements of the cow before calving. It is very important to ensure a minimum dry period of 50 days in my opinion. After drying off generally will lead into a quieter time on a dairy farm and in my view this is like ‘preseason training’ for the cow and farmer. I also find drying off a good time to assess trace elements by blood testing cows and checking forage analysis. I like to do this by using a drying off audit at two stages early dry off and again mid-way through the dry period. It is also a great time to review cow comfort and cow accommodation to minimise stress at this period for cows that are housed during their dry period. Once we know what BCS is at herd level we can be much clearer managing nutrition in dry period. With trace element analysis of bloods and forage we can also make much more accurate decisions around supplementation. This is the time period usually 3 weeks either side of calving. A well-managed transition period will set a cow up for the forthcoming lactation. It is a huge change for a cow at calving especially in relation to dietary energy and calcium requirements. The cow’s rumen or main stomach must adapt to a new diet that will help her meet the huge energy demands in the first 6 weeks after calving. Also the cow must meet the calcium demands when milk production begins. Managing energy intakes and calcium correctly at this time can have massive benefits in reducing metabolic diseases. These metabolic conditions severely affect a cow’s immunity and performance in the first few weeks after calving. This for me is a really important CCP, if not the most important one! One thing that I find very useful to look at if cows are housed during this period is feedspace and DM intake. 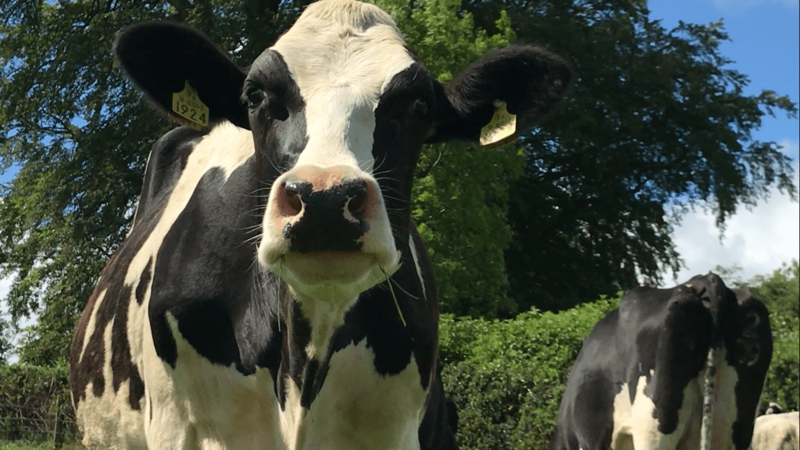 It is so important to ensure we maximise DM intake in the freshly calved cow and this diet is suitable for the levels of production we are trying to achieve. In a lot of our dairy farms we predominantly feed silage in the winter months. Some farms will feed a TMR also but this depends very much on cow type and energy needs of that cow. Due to the fact a lot of our cows spend their time on forage at critical times like around calving in my opinion it is essential to work out what the makeup of these forages are. This can be done by getting forage assessed for energy protein minerals and trace elements. It allows us more accurately predict what we are putting into the cow and work out her required intakes. In dairy farms we want cows to calve down in a clean stress free environment. Sounds simple but in a busy spring calving herd it can be sometimes difficult to facilitate this all the time. If we maximise space and comfort for the freshly calved cow she is more likely to go ahead calve normally and eat quickly which is critical as she adapts to the demands on her system for milk production. It is also so important that claves are born into a clean warm environment to reduce their exposure to diseases like scours in the first 3 weeks of life. It is a critical point to reduce infection pressure which as calving progresses grows and puts pressure on calves. For calves they are born without their own innate immunity which means they need to obtain their immunity from their mother’s first milk. The rules are simple around colostrum the 1st milk in the first 2 hours of life at volumes of 3 to 4 litres (depending on breed of calf) in the first feed. Have a plan here and stick to it. Colostrum must be stored in clean containers and if being frozen or thawed at the correct temperatures. I feel contaminated colostrum and poor management can be an issue so hygiene is critical with colostrum harvesting. It can be useful exercises to test colostrum quality on farm using simple colostrometers which allow monitor the quality of nature’s liquid gold. We can also check passive transfer to ensure correct volumes are being given to calves this can be done by blood testing calves 2-7 days old and checking serum proteins. This for me is a simple management procedure that will tell us most if not all of what we need to know about colostrum management on farm. Most of the diseases that affect calves in the first 2-3 weeks of life are neonatal diarrhoeas. One area where I feel this can be reduced is focusing heavily on hygiene of pens and utensils. Calf pens should be easily cleaned and disinfected. Also all equipment should be disinfected to prevent spread of disease. This can be very important between seasons where all calf pens should be thoroughly cleaned and disinfected. If you think about calf pens they are the perfect environment for bacteria and bugs to spread if they aren’t well managed. Having a CCP around hygiene tackles this issue of disease spread and in my opinion will often reduce infection pressure (the amount of bugs or bacteria in the environment) in calf pens. As calves get over the first week of life we start seeing pneumonia as a risk. Ventilation plays a key role here. Supplying calves with warm bedding and fresh air at calf level can significantly reduce stress and respiratory disease. Assessing stocking densities and airflow in calf houses can be hugely beneficial as part of a pneumonia control program. One area where I often investigate is cell count or SCC issues on farms. Often they can be multifactorial in origin. More times than not however the milking routine can be a huge contributing factor. It is no coincidence that low SCC herds often have a consistent routine involving excellent hygiene. There are a number of CCPs you can put in place at milking time around hygiene that can make a huge difference, like pre/post teat dipping wearing clean gloves etc. etc. Of course there are numerous things to consider when talking fertility in a dairy herd. However for me again a critical time is prebreeding to have that plan in place. To get the cows in calf we need to catch them in heat and inseminate them using a bull or AI. With a shift towards AI and better genetics it is critical that heat detection is excellent. We need to ensure cows are cycling and then spot the cows in heat accurately. This can be done by spending time observing and also utilising heat detection aids to help us be more efficient. We must also make sure that at herd level there is nothing suppressing immune function in our cows. Again getting BCS right prebreeding, ensuring energy demands are met by energy and DM intakes is key. we sometimes forget about how important our young stock are to the farming enterprise. I once heard the heifer calf referred to as Cinderella, basically she is forgotten about until she gets to the ball (milking parlour). We know there are a number of diseases that can affect performance as are there numerous nutritional challenges such as weaning etc. A very safe and practical way of assessing performance in young stock is regular weighing. It allows us assess performance over a time period and intervene when targets aren’t being met. If we have an idea of birth weights, weaning weights and at 6 months it can be a start to assessing youngstock performance. Remember we need to have heifers calving down at 22-24 months of age. Feed efficiency is at its most efficient in young animals. So for input we tend to see maximum benefits in outputs or with gains. For young heifers to be productive we need them hitting certain targets over their young growing lives and calving down at 22-24 months of age. Knowing your targets allows you have these heifers healthy and ultimately entering the milking parlour earlier at the right time to pay you back for the time and money you have invested in them. It can also be a very good indicator of disease control on farm. Especially when monitoring parasites in young stock. I am a huge advocate for planning parasite control and vaccination plans. Each farm can be very different in relation to both but planning at least ensures that the correct products are used at the correct times to allow maximum efficiency from them. It is worth spending an hour drawing this up to give you more control over these two sometimes important elements controlling disease on farm. They should be adapted regularly to the ongoing needs and challenges of your herd. We can put all these control plans into a farm health plan. I have created my own template which is simple. It allows me to monitor the farm and simply deal with issues when they arise. This allows much more proactive planning as opposed to being reactive. It also allows me to monitor performance like in any business which is critical.